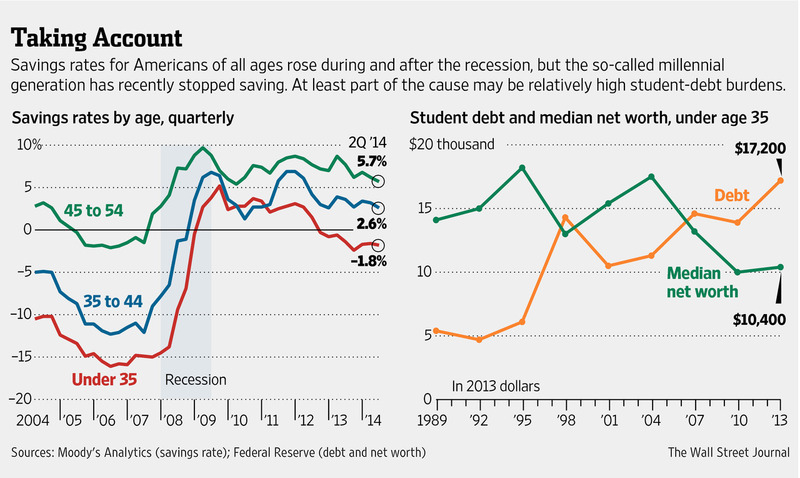 Young adults in the United States are not saving. In fact, on the whole people under 35 are facing a saving deficit of close to 2 percent. According to the Wall Street Journal and new data from Moody’s Analytics, the savings rate for those under 35 group has fallen from its post-recession high of 5 percent down to 1.8 percent today. Meanwhile, the savings rate, which is the percent of disposable income that people choose to save, is 2.6 percent for people from 35 to 44 and 5.7 percent for those 45 to 54. There could be a multiple causes for the discrepancy in savings between the groups, but often cited reasons include student loan debt, a 10.5 percent unemployment rate for those between 20 and 24 years old, and low salaries for those just starting out. Another interesting story in the data is the fact that all three age groups were not saving in the lead up to the recession in 2008. Americans under 35 faced a savings deficit of 15 percent between 2006 and the start of the recession. Those between 35 and 44 had a savings deficit of nearly 12 percent over the same time frame.